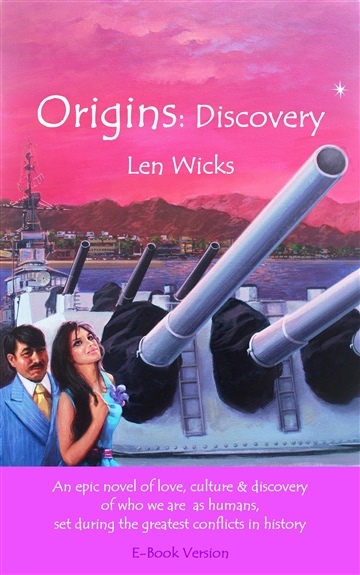 Len Wicks is a dual Australian/New Zealand citizen, who is married with three children. He has a background in aviation as an air traffic controller working in New Zealand and the Sultanate of Oman, and in air traffic management in Thailand for the Asia/Pacific Office of the International Civil Aviation Organization, a United Nations specialized agency. Len's interests in geography and history had led him to travel extensively worldwide - but in particular to Russia, the Ukraine and the Caucasus, where he met his Armenian wife, Armine. He has interests in sport (the national religion in New Zealand is rugby! and he was a netball coach for many years), and children's education (http://www.ody-see.com). Writing Origins: Discovery wasn't planned. It was only after returning from a trip to Armenia that the story came to him, and the process of turning a vision into reality started. The motivation to write every day for 21 months in a novel style that was completely unfamiliar to him was provided by his family's encouragement and the knowledge that the world should know about history such as the Armenian Genocide. Len hopes that people will learn about other cultures and treat each other more kindly as a result of the work.